The LOVEFiLM service is an Amazon owned company that offers an unlimited streaming service with a massive selection of content in both Movies & TV shows to watch on a number of mobile device, pc and mac. The content is not premium though, so the latest movies will not be available until sometime after the DVD release. They also offer a DVD Blu-ray by mail service. Like Netflix in the US, viewers can choose either or both. The Amazon subsidiary has a lot going for it. Its easy-to-use interface means people will not be baffled by its search engine and its plethora of content - including new as well as older films - caters for a wide of range of people's tastes. LOVEFiLM is most probably the most identifiable name out of all the current on-demand streaming services thanks to its disk-rental service which is in its eighth year of existence. It is principally based in the UK but also supplies its services in Scandinavia and Germany. In 2011, LOVEFiLM launched its LOVEFiLM Instant application which has been equally as successful as its rental service. However, with the emergence of a number of competitors such as Netflix and Amazon Instant Video, it is starting to face some considerable competition. Granted LOVEFiLM still has a monopoly over the internet streaming industry - Ofcom's statistics are testament to this theory finding in March this year that it had 2.5 million viewers as opposed to Netflix who had 1.2 million respectively. But is its service really that good and has Netflix got the tools to steal its market share in the foreseeable future? One positive is that LOVEFiLM Instant does have depth of content. With its on-line service you can choose between over 7,400 television episodes and movies. The latter of which I believe is the service's best asset. Thus, you see films released on a weekly basis. This week for instance saw God Bless America (2011) and Unrivaled (2010) available to stream as well as many of which were in the cinema at the tail-end of 2011. Moreover, the number of movies in the IMDB's top 250 is much higher than Netflix - for instance LOVEFiLM has The Shawshank Redemption (currently number one on IMDB) whilst Netflix does not! Although LOVEFiLM's broadcasting nemesis may have more in its Thriller category, LOVEFiLM Instant has much more up-to-date content than Netflix who publish films which are dated such as April Fool's Day from 1986. However, its pitfall lies in its television shows which are revised less frequently than its rivals. Indeed, out of IMDB's Top Ten most popular TV shows LOVEFiLM only stores one which is Doctor Who. While Netflix stores four - Breaking Bad, Dexter, The Walking Dead and Doctor Who - together with promising more on the way given their UK operations, I would argue, is still in its infancy. LOVEFiLM Instant allows you to stream your content instantaneously to your PC, Apple iPad, Xbox 360, Playstation 3, televisions, blu-ray players, home cinema system and set-top boxes such as the Digital Stream Set-top Box and Sony Network Media Player. Although this is a comprehensive number of devices you can stream off, the Android software is missing. This is, of course, a compatibility required nowadays. The fact that Netflix offers it to some Android devices over and above the aforementioned platforms consequently means it has the market edge. However, there has been speculation surfacing suggesting the compatibility is on its way soon! "We're working on bringing full HD to Sony and the PlayStation 3 very soon, sorry for the delay (remember, the PS3 already plays titles in higher quality than standard definition)". The Apple iPad does not present stream HD content as the Amazon subsidiary is seeking studio rights - so it is certainly in the works. By extension, there are a number of HD films and television shows available but by no means an abundance. There are approxamitely 200 films in HD which is still way short of Netflix whom have virtually all their content in High-Definition. Therefore the previous criticisms of standard quality streaming and being limited to 2 megabytes a second are now almost redundant. There is. of course, a sufficient amount of server capacity meaning that you do not have to stop mid-way a television programme which ultimately culminates in a good viewing experience. On the other hand, one can still not enjoy a HD, cinematic experience on their tablets such as Apple iPad. So if you were planning on watching a top-rated film such as Lord of the Rings: The Fellowship of the Ring - you will have to wait to enjoy it in its true glory! In addition, one undeniable drawback is that LOVEFiLM Instant does not support Dolby surround sound so in terms of a cross-platform cinematic experience, Netflix bears the trophy for this! I really like LOVEFiLM's homepage and browsing its web-pages. Scrolling down in the films page for example and then viewing the library is straightforward. This is in stark contrast to Netflix who have categories and in them a slider function. This function does not readily indicate, to me anyway, that you must press the category itself to get view more. Instead, I found myself scrolling through the slider function which wasted my time where I could have been watching a TV show by that time on a more simplistic user interface like LOVEFiLMs! Furthermore, It is also dependent too much on its matching search engine and it actually - in some categories - repeats its content. For example, Saving Private Ryan is in the drama, critically-acclaimed and inspiring categories almost to compensate for their ubiquitous lack of fresh film content. Having tested it on my PS3 and TV, I was generally impressed despite a couple of interruptions. However, this is understandable as my broadband router is on the other side of the house. On the Xbox 360 front, a friend informed me that the user interface was fantastic. He went on to explain how it goes well with the dashboard making it straightforward to navigate your controller through the various menus! The Amazon subsidiary has a lot going for it. Its easy-to-use interface means people will not be baffled by its search engine and its plethora of content - including new as well as older films - caters for a wide of range of people's tastes. Having said that, the choice of TV programmes is significantly inferior to that of its fierce rivals and the fact that it lacks HD quality on the Apple iPad and PS3 is a big blow. If they can correct the latter, I feel in terms of internet streaming and its mobile application, it will be superior to Netflix and Amazon simply because of its functionality and ease-of-use - which is most conducive to those travelling! The fact, too, that it is �1 cheaper a month for the internet streaming service alone compared to Netflix is - I suppose - an ancillary factor but I believe it still retains its edge personally because I'm a film man. 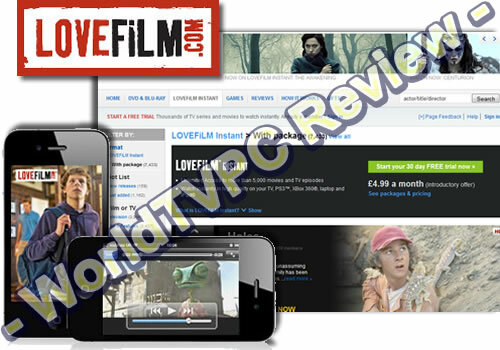 Review: I\'ve had the Lovefilm streaming only package for about 8 months and I love it. I watch on average two movies a day and occasionally some TV shows, yet I never seem to run out of things to watch. I love the fact that they have films for all tastes. You can search by decade which is great. The site is very easy to navigate. I think it\'s well worth the �4.99 a month. Review: It is not bad, it has a decent selection of streaming movies but could be a lot better. Problems are the sound quality - I have a 5:1 surround system which Lovefilm instant cannot cope with also no matter what they say HD streaming is very variable with significant stuttering even on a 20 MB broadband. Summary: Good for dvd rental. Review: Bit like Netflix. Great for dvd rental. Great for dvd rental and streaming, but pretty lame for just streaming..
Review: Signed up to a LoveFilm free trial which was ok, but was not impressed with the selection of streaming movies. If your used to their DVD by mail service you will find the Instant service does not have anywhere near as many titles available. So when i tried to cancel, i cannot find anywhere on the site to cancel the subscription. In the end i had to phone them up and was told i need to give 30 days notice! !